Pro-Umno poster: “Do you want to see your grandchildren praying in Allah’s house? [Not] if we allow Allah to be used by churches”. On Sunday, May 5, Malaysians head to the polls for what could be the most critical general elections in the country’s history. The ruling coalition, dominated by Umno (the United Malays National Organisation), has been raising issues of religion and race in an effort to win the support of the Malay Muslim majority. Meanwhile minority Christians in Malaysia are taking a bold political stand. At the behest of their churches, worshippers are being asked to openly pray for political leaders who are honest and uncorrupted, and to elect a government that values liberty and religious freedom. The message is clear: it is time for a change after 56 years of rule by an Umno Government which stands accused of rampant corruption, breeding a culture of entitlement for privileged Umno politicians and their families, abusing power, and fanning the flames of ethnic and religious bigotry. For the first time, a credible political opposition could conceivably end Umno’s stranglehold on power in the multi-ethnic country, where Christians form 9.2 per cent of the 28-million population. The blatant attempt to pit Muslims against Christians and resurrect Umno’s ban on churches using the word ‘Allah’ to denote their God has outraged the Christian Federation of Malaysia. In an outspoken statement on Tuesday, its chairman, Rev Eu Hong Seng, demanded that the authorities “act swiftly to douse the sparks of such religious fear-mongering from catching fire once more”. He said: “These fears are real given the recent history of church burnings and threats to burn the Bible in the Malay language.” A church was burnt and several others vandalised in 2009 when the High Court ruled that the Catholic Church had the right to publish the word ‘Allah’ to describe God. The Malay-Muslim Umno Government has appealed against the judicial decision. The opposition supports the right of Christians to use Allah in their liturgy. Pictures of the billboards went viral on the Internet. This latest scare tactic to drive a wedge between races and religions comes amid a surge in election-related violence. Explosive devices have been planted near rally sites and there have been more than 2000 cases of arson. Motorcycle gangs of Malay Muslims roam towns and venues to intimidate people from attending opposition rallies. The print and television media, overwhelmingly controlled by Umno or its supporters, has blacked out positive news coverage of the opposition. The latter has also been refused advertising slots in print, the national radio and television stations and cable TV. Its campaign has focused on the digital media – Twitter, Facebook, You Tube, blogs and Google (which has set up a special Malaysian election page) – to get its message across to the nation. Despite widely reported flagrant abuses of Government largesse in buying votes by giving cash hand-outs and inflating electoral lists with migrant voters who have been given citizenship in lieu of their ballots, growing numbers of people are flocking to opposition rallies. 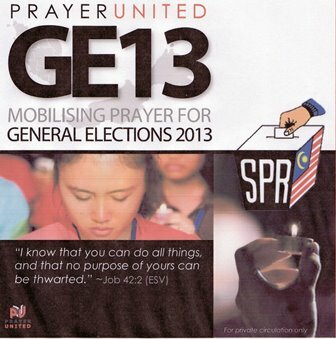 The Council of Churches of Malaysia (CCM) meanwhile issued a booklet titled Mobilising Prayer for General Elections 2013, calling on all churches in Malaysia to mobilise prayer for the “spiritual reset of the nation”. The comprehensive 60-page template lists phases of prayer – from nomination day to eve of polling, polling day to counting of votes, and for the setting up of a stable Federal Cabinet and state governments. Prayer vigils and prayer chains to pass the ‘prayer baton’ around the clock are currently being held. The booklet also offers practical information for voters to locate polling booths, to use indelible ink, to not allow polling clerks to stain or smudge one’s ballot paper, and to volunteer as election observers. Voters with smartphones are encouraged to shoot videos and pictures in monitoring the fairness of the electoral procedure. In a separate media campaign, the Catholic Research Council together with the CCM uploaded a video on YouTube reminding viewers “to reflect on their roles as Christian Malaysians and vote for a country whose leaders are honest and uncorrupted, where none is exploited, and for liberty and religious freedom”. “We speak with pastoral and moral responsibility and authority against religious bigotry, racism and extremism in any form,” the communique added. 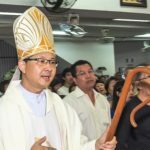 Rev Datuk Bolly Lapok, an ethnic Iban who is the Anglican Archbishop of Sarawak and the newly appointed Archbishop of the Anglican Church in South-east Asia, is the architect of the new outspoken position taken by the churches. The action is unprecedented; the churches in the two states traditionally have maintained a cordial relationship with the government. As claims of vote rigging intensify — there are allegations that the government has chartered flights to bring in “voters” from abroad — so do calls for election integrity. Kofi Annan, the former United Nations Secretary-General who is now chair of the Global Commission on Elections, Democracy and Security, called on Malaysia to ensure free, fair and credible elections. 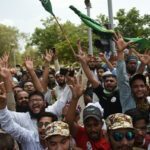 He said Sunday’s poll could prove to be a turning point for a country that has been a model for developing countries across the globe. Of concern to the churches and many voters is the spectre of May 13, 1969, when racial riots broke out after the Umno Government lost control of key constituencies including the capital Kuala Lumpur. In response to fears of a violent backlash if the Umno Government loses overall power this Sunday, the churches ask worshippers “to beseech God to stop any attempt to stir up rioting, and that the powers of darkness will have no freedom to advance the cause of evil, injustice and extremism”. Matt George is a former journalist for ‘The Times’ of London.